A collection of correspondence between the poet-novelist and her diplomat-politician-author husband spans fifty years to recount their turbulent and open marriage, Vita's lesbian affair with Violet Trefusis, their colorful circle of friends, and more. 25,000 first printing. 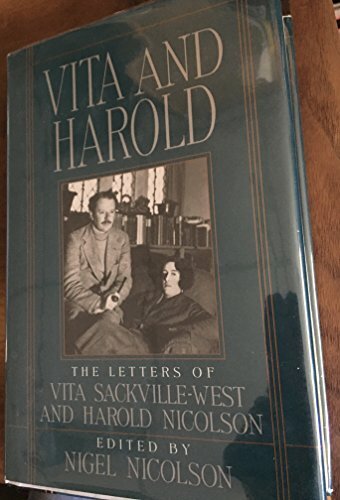 Nicolson's distillation of the letters between his parents- -poet/novelist Vita Sackville-West and diplomat Harold Nicolson- -further documents the extraordinary relationship he described in Portrait of a Marriage (1973; to be dramatized on PBS later this year). What do we learn from this intimate dialogue about the marriage that sustained itself from 1913 until Vita's death in 1962, through homosexual affairs and separations extensive enough to produce 10,000 letters? That the bond between Vita and Harold depended on affection, respect, love, and, perhaps above all, on a degree of tolerance and openness--at least on paper--that few couples could handle. Living very much their own lives (she talks about gardens and friends, he about the abdication of the soulless King Edward), they both were devoted to their two sons (though the boys are rarely mentioned), and they cared passionately for Sissinghurst Castle, where they built legendary gardens. Until Harold left the diplomatic corps in 1929, he invigorated the correspondence with eye-witness reports--some witty, others highly serious--from abroad: Constantinople, Berlin, Tehran. Working on the peace treaty in Paris in 1919, Harold describes the Arc de Triomphe after the signing as ``black with people watching the cars stream up the Avenue du Bois.'' The emotional wattage rises on the subject of Vita's notorious affair with Violet Trefusis. ``I wish Violet was dead,'' Harold writes. Later, Vita tells him that ``there is lots that is neither good or simple in me, and it is that part which is so tempted.'' Typically, she ends this letter with, ``my darling, my darling, I shall love you till I die.'' Most interesting is what Vita reveals about her intense relationship with Virginia Woolf (``angel of wit and intelligence''), who re- created Vita in Orlando. A vivid and extensive primary source on private lives--lives whose modernity reveals convention-flouting individuality and speaks much about Britain's upper class and its attitudes and freedoms. -- Copyright ©1992, Kirkus Associates, LP. All rights reserved.